In the previous posts on high availability architecture, we have already talked about scaling databases and Content Delivery Networks. Many a times, we have talked about evenly distributing the requests to the different nodes, and also about how to avoid downtime when some node or component fails. In this post, the prime objective is to talk about these processes of load balancing and failover systems in details. Load balancing is a technique of distributing your requests over a network when your server is maxing out the CPU or disk or database IO rate. The objective of load balancing is optimizing resource use and minimizing response time, thereby avoiding overburden of any one of the resources. We are happy to announce the new WebsharePro uploader under Apache 2.0 license. Source code for this application is available at the Tonido developer repository. The current release has binaries for windows. Since the application is made with platform agnostic development libraries, it will be easier for other developers to improve, extend and migrate the application to other platforms. Webshare is an application that runs on the Tonido platform. 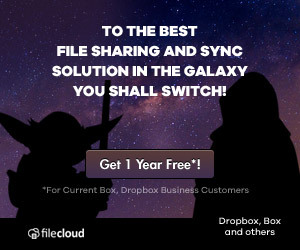 It lets users to share files from their home computers and make it available from anywhere on the internet. It lets users create accounts for friends and family thereby giving restricted access based on the identity. You can try the free download from here. WebsharePro extends the ability of Webshare by allowing upload of files to their home computers from anywhere on the internet. It also makes it easy for users to send and receive files from others. A browser is the only requirement to upload files to remote computer. It is important to note that there are some drawbacks in using just a browser to send files to another remote computer. When a user wants to upload multiple files, he/she can only upload only one file at a time. Hard to upload a directory and its contents. Contents can be files or sub-folders. It is not possible to perform drag-and-drop of files and folders to be uploaded. 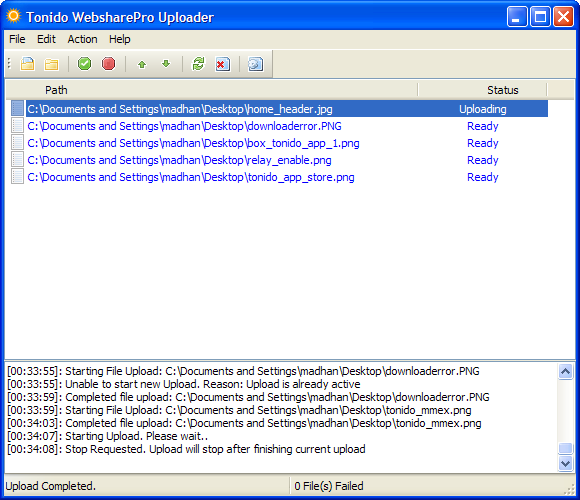 To overcome these issues we introduce the new WebsharePro Uploader. This is a standalone native application that is currently released only on windows. Once the application is downloaded and installed, all you need is to specify the Tonido URL, user name, password and you are good to go. You can use the built-in file/folder chooser or drag-and-drop files and folders. Uploader starts uploading them without anymore user attention. Go here for more information on setup, configuration and use of this uploader. If you don’t have WebsharePro, you can also buy it from our Tonido Store. Save your personal data before it is too late. Do you store and share your photos online? Watch out. Does this bother you? Is your data safe and secure? If giants such as Yahoo, HP, and Sony closed their online storage services then it is a real possibility that it can happen to any company any time. Remember that Your data is secure and safe at no other place other than your PC. Create a backup plan and backup the data in your hard drive at regular intervals. Avoid storing sensitive data and personal photos online that you cannot afford to lose. Hmm… But some of us want to share this data with friends and family. Peer-to-Peer (P2P) service: With a P2P service, you can directly share your files and photos with your network of friends and family without having to upload to web or email the photos and files. Good.. But I want to access my files and photos from anywhere. Tonido gives you the best of both worlds. Tonido does Peer-to-Peer file and photo sharing. In addition, Tonido gives an unique benefit of accessing files, photos, music etc that reside on your PC from anywhere. DNS or Domain Name lookup Service provides the mapping between internet addresses such as 22.43.68.133 to a human readable (and memorable) address (known as URL) such as www.apple.com. Without a DNS service it will be difficult for us to remember all the internet server addresses that we use daily. These address mappings will be hosted by some well known servers on the internet. These mappings can be created usually for a flat fee by many vendors. These mapping servers are very reliable in providing the name resolution. Dynamic DNS (DDNS) is also a name to internet address mapping service but more suitable for home or small business users. The basic Dynamic DNS (DDNS) service is provided free by many service providers(www.DynDns.com). 1. You have to pay for a DNS mapping service. 2. If the home computer is assigned with DHCP address then you have to update the mapping every time there is an address change. But with DDNS service, you can get a basic mapping service for free and these services are suitable for even DHCP addresses. This is made possible by some kind of DDNS client. There are two types of DDNS clients. A client that runs on your home computer. A client that runs on your router itself. No matter where the client runs, the functionality of the clients is the same. They connect to the DDNS provider at regular intervals and update the mapping. When the DHCP address at home changes, the mapping will be updated automatically on the next update. If you choose to go with type 2 client, there are lot of free and shareware DDNS clients available on the web. You can select them depending on the operating system of your home computer and the feature set offered. DDNS clients are not available on all home routers, though newer routers mostly have this functionality. Some configuration involved in running a DDNS client on your computer. Let us assume that you have setup a DDNS at your home. Now what do you do with that. Actually DDNS setup can be found very useful for your day-to-day applications. Here are some of the uses. Run your own personal web server hosting websites, blogs etc. Run your own mail server for sending and receiving mails. Tonido is a new software from CodeLathe that includes DDNS client functionality. It is available for Windows, Linux and Mac OSX. Upon installation, user needs to create a new account and this new account name will be the users URL. For example, If you create an account called ‘John’ then you can access your home computer from anywhere using the address ‘john.tonidoid.com’. There is no other configuration needed. Tonido also comes bundled with a bunch of applications that will make your DDNS setup worthwhile. Jukebox: Listen and organize your MP3 song collection from anywhere. Web share: Host a quick file download server allowing access to your files from anywhere. Hosted files can be downloaded via any web browser. Photos: Securely share your photos with friends and family, without uploading to any third party servers. Workspace: Personal Information Management tool that lets you to sync notes, calendar, contacts, to dos, chat messages among your friends and family.